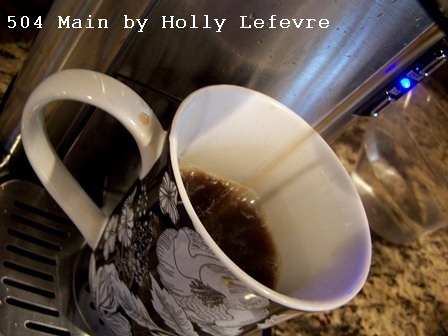 504 Main by Holly Lefevre: Christmas in May Thanks to The Scoop! You all know I LOVE my coffee, right? Well, here is a little tale of finding coffee happiness. and he saw something that he knew I would like. 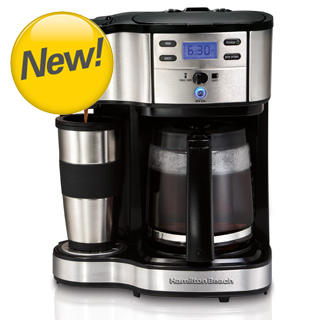 We had been "discussing" the pros and cons of single serve coffee makers for awhile. I really, really wanted one...but I could not wrap my head around the idea of those pods/cups/whatever you want to call them. It just seemed wasteful. "You can brew your own coffee!" And it was a SUPER-good price. Hubby did not buy it. He waited to ask me if I wanted it. Crazy man - it was half-price! 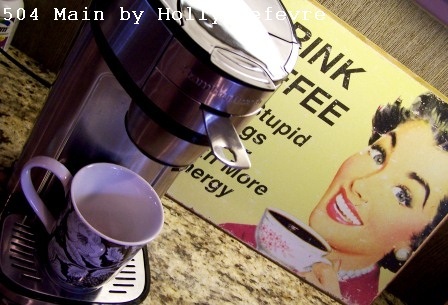 Still no single serve coffeemaker for Holly. I torture hubby about this decision, er procrastination, daily. Now it is April and I am Heading off to New York from Sandra Lee's Summer Carnival...still without my single serve coffeemaker. Hubby may never live this down. The Scoop delivered to my door. That is my Christmas in May! Can I tell you how much I LOVE The Scoop. I use it multiple times a day. Grab your favorite ground coffee - yes your own favorite real ground coffee! Scoop it up and place it in the machine. Place you cup in the right spot. and wait a few minutes for an amazing cup of coffee! I love serving them a fresh cup every time they come over. My favorite mug, The Scoop...and of course there is whip cream! 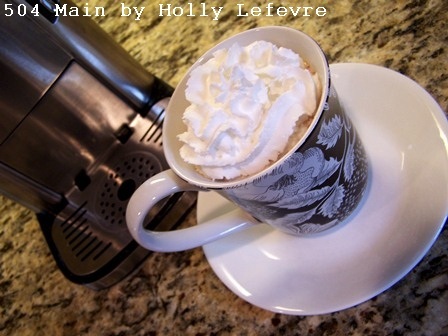 I like my coffee with a little mocha powder and whipped cream. A BIG thank you to Hamilton Beach for making my Christmas complete! 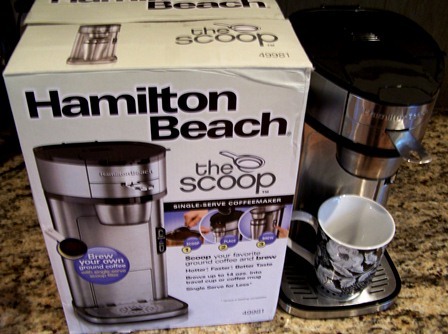 Disclosure: Hamilton Beach provided The Scoop to me under no obligation to blog/promote it. 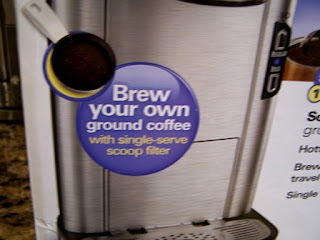 I LOVE this single serve coffee maker and feel the need to tell ya! The blog post, opinions, and story are my own. OH MY! I think I just fell in love(Sorry Honey!)! I have been thinking over getting a single serve coffee maker myself here lately. However I have held back for two reasons. 1. My coffee maker still works perfectly fine and 2. I didn't like that I would have to buy those little individual cups to make the coffee. I love getting my coffee beans from Starbucks and then grinding them at home and having fresh brew every morning! But now you are telling me that I can have my Coffee beans and drink them too! Oh this is a dream come true! I believe I am going to start hinting at having this as an anniversary present as our anniversary is coming up in a few months! Thanks for sharing!